As it turns out, she was, it did, and how. Since its founding in 1984, the Canadian-based Cirque du Soleil has garnered great international attention and for very good reasons. This nouveau circus is a unique, if often copied, blend of death-defying acrobatics, slapstick clowning, surprisingly in-depth character work, and a colorful visual style that combines vaudeville, street fashion, traditional circus, international styles, and sheer fantasy. The company boasts a wide number of touring shows, as well as a few permanent locations. In addition to their regular shows featuring original music, Cirque du Soleil has also produced the Beatles-inspired show, Love and plans to unleash a show in October of this year about the king of pop, Michael Jackson The Immortal World Tour. 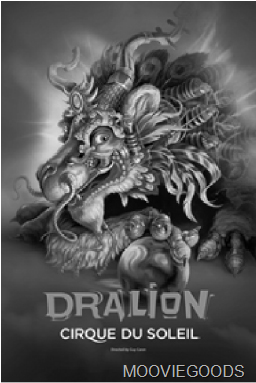 Dralion, a portmanteau of dragon and lion to complement the advertised East-meets-West theme (though as the performance makes great use of Indian and African inspired designs, the theme in actuality is more multicultural), recently stopped in St. Louis on its current tour. The performance is unique in that it heavily incorporates elements of Chinese circus, including impressive contortion, hoop diving and a modified lion dance using the titular Dralions, fuzzy creatures reminiscent of both dragon and lion dance costumes. The performance is nothing if not colorful. The vibrant blues, greens, oranges, and reds that dominate the show, representing air, ocean, earth, and fire, make even the brilliant gold robes of the show’s singers look dark in comparison. The bright colors tie in well with the constant movement of the show. Warrior-like dancers twirl bright red flags in formation, goddesses dance in the air while twined in ethereal blue ribbons, and orange Dralions frolic and gambol around the stage. In addition to being a visual feast, the acts of Dralion are impressive. As I watched the show, I learned many things about the human body. One: that humans can bend in ways that put boneless octopi to shame. Two: that it’s possible to turn bouncing on a trampoline into an art form. Three: that I’ll never play Double Dutch nearly as well as a pyramid of performers stacked three levels high. If I could describe everything in minute detail, I would tell about every tiny movement of a spider-like juggler, of the speed and precision of a group of dancers diving through hoops seemingly too small to fit a human body through, of the gasps of the audience as the first refrains of music started. Ah, if only I could! Alas, there’s far too much to tell. While I make no secret that the show was the most enjoyable event I’ve been to this year, I can’t pretend that it was without flaws. One of the most noticeable to me was the uneven blending of its humorous and serious moments. The show combines beautiful, occasionally somber and very serious acts of acrobatics with slapstick clown skits, but the two halves seem disjointed. The clowns have little connection with the rest of the performance and seem out of place, as if they wandered in from a completely different, more whimsical show. That is not to say that the clowns are bad; to the contrary, they garnered great applause from the audience and their unique send-up of the entire performance was a highlight of the show. I would not necessarily say they were the funniest of Cirque du Soleil‘s clowns and the audience plant they honed in on was very obvious, but they have a long history to compete with. While amusing enough in their own right, they could have been much more if it made thematic sense for the clowns to be there. Contrast in itself is not a bad thing, but in this case, it makes one wonder why the clowns, such an unexplained departure from the rest of the show, are even there in the first place. So what are my final thoughts on Dralion? It’s a good show in its own right, but even after a decade’s worth of performances, it could do with some work to make it great. In comparison to other Cirque du Soleil shows, the production seems smaller and more toned down in terms of storytelling, so it may be disappointing to those who have already seen the other shows. However, for those of you who have never seen a Cirque du Soleil show or, like me, have only ever watched the tapings, it’s a real treat and sure to be a memory you won’t forget for awhile.